SS 9 is a specialized spreader sticker that was created to increase penetration and effectiveness of fungicides with the lowest label rates. Replacing a portion of your high cost chemicals with SS 9 can give a substantial cost savings while being more effective and environmentally responsible! That’s money back in your pocket! 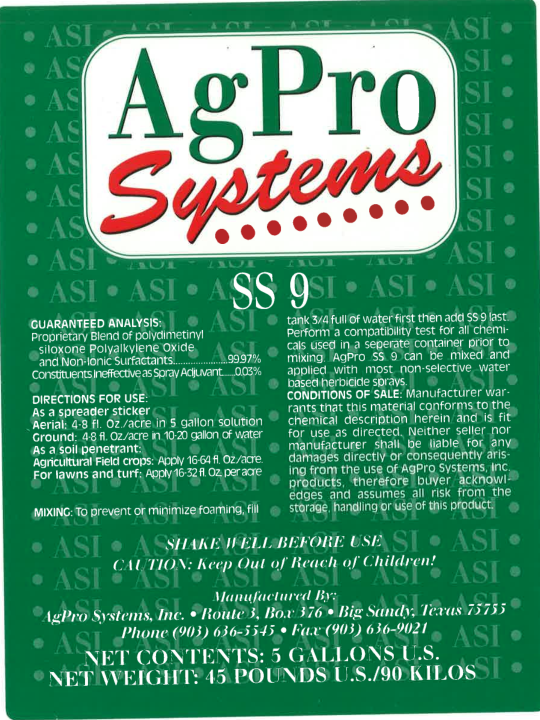 AgPro™ SS 9 is recommended for use with fungicides and can be used with other pesticides. It was formulated to enhance and to extend the life and the effects of fungicide applications. Some pesticides may require higher or lower surfactant rates for the desired results. SS 9 can be used with ground applied fungicides and fertilizers. Shake well and mix in enough water to distribute evenly. Can be tank mixed with most liquid fertilizers, herbicides, insecticides and fungicides. Use in conjunction with a good soil test and soil fertility program. AgPro™ SS 9 can be applied in existing spray programs. Always conduct a compatibility test prior to mixing any chemicals. Prior to application, all spray/mixing and application equipment must be cleaned. Carefully observe all cleaning directions on product label. To prevent or minimize foaming, fill tank 3/4 full of water. Add pesticides and/or fertilizers as directed by label or in following order. Add SS 9 and mix with normal agitation. Continue filling tank maintaining agitation. Store in original container only. Keep container tightly closed. Do not allow water to be introduced into contents of container. Do not contaminate water sources by runoff from cleaning of equipment, disposal of equipment wash water or spray waste. Do not store near heat or open flame. Container Disposal: Triple rinse (or equivalent) container. Offer for recycling or puncture and dispose of according to state and local authorities. If burned, stay out of smoke. IF SWALLOWED: Give a large amount of water to drink. DO NOT induce vomiting or give anything by mouth to an unconscious person. IF IN EYES: Immediately flush with clean water for 15 minutes. Consult a physician if symptoms persist. IF ON SKIN: Remove contaminated clothing and wash with soap and water. If contact is made with the spray solution containing pesticides, follow the “Statement of Practical Treatment” on the pesticide label. Consult a physician if irritation persists. Avoid contact with skin, eyes, or clothing. Do not apply in such a manner as to directly or through drift expose workers or other people. If mixed with pesticides follow precautionary statements on the accompanying pesticide label. Disclaimer: The information contained herein is furnished without warranty of any kind. Users should consider this data only as a supplement to other information gathered by them and must make independent determinations of suitability and completeness of information from all sources to assure proper use and disposal of these materials and the safety and health of employees and customers and the protection of the environment.